The caretaker boss guided his side to the Scottish Cup quarter-finals. 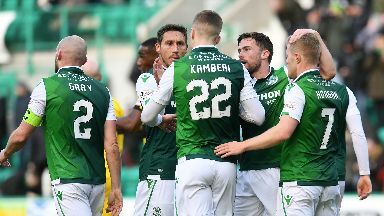 Hibs caretaker boss Eddie May guided his side into the least eight of the Scottish Cup and then revealed that the 3-1 win over Raith Rovers would be his last in charge. The Easter Road side have been searching for a successor to Neil Lennon, who left the club last month, and May said he has been told that an appointment will be made next week. "That will be my last game and I am delighted to go out on a win," he said. "The new man is coming in and at least we are in the quarter-final. "I have been told this was my last game and that the new man will come - I was told about five minutes before kick-off. I won't be in charge for the Hamilton game. "I don't have a clue who they've got. They just thanked me and Grant for what we've done and the new man should be announced some time this week. "I know Grant and I will take training on Monday as normal and maybe Tuesday or Wednesday the new man will be announced. It will be exciting and challenging because the new man will maybe put a different stamp on what he wants." Raith manager John McGlynn had no complaints about the result and said he could take pride in his side's showing. He said: "Did the best team win? Yes, definitely. We needed Hibs to have an off-day, which they didn't. "Hibs played very well. And we needed to stay in the game and I'm proud of the players that at 2-0 down we didn't ship four or five. We didn't want that to happen. "At 3-0 it's difficult, but we didn't crumble and stuck together. We showed good spirit and got a goal back and, if we had got it back to 3-2, it would have been interesting - very interesting. But I'm reasonably proud of how we played."